Over the last few months I have grown quite fond of tea. In the past, it was always something I drank when I was sick. But now, especially in these cold months, I have enjoyed the quiet process of making a cup of tea in the afternoon and even before bed. There is something calming about having to wait for the tea to process. I am forced to be patient, which is something I struggle with daily. And while I enjoy drinking a hot cup of tea throughout the day, I love experimenting with different recipes on how to incorporate a few of my favorite flavors into desserts, breakfasts, even cocktails. This recipe, is very simple. Three ingredients and a little time. I have tried it with Earl Grey, and absolutely loved it. I think a mint, like peppermint or spearmint would be really great too. Or even a green tea! So like all recipes, have fun, experiment, and enjoy! To win this box of Smith Teamaker Meadow, head on over to my Instagram account. Place the tea bag in milk and let steep. Using a double boiler, fill the bottom pan with 1" of water and place insert or large bowl over top. Fill with chopped chocolate and melt the chocolate over medium, stirring occasionally. Once it is completely melted, place the broiler insert into the large bowl filled with ice cubes. Remove the tea bag, and add the meadow infused milk to the chocolate. Stir with spatula until almost combined. Using a hand mixer, or kitchen-aid, beat the mixture for 4-5 minutes, first on low and gradually increasing to medium speed. There will at first be a lot of bubbles, at about 4-5 minutes the bubbles will fade. Quickly fill your small jars. Give them a quick tap on the counter and cover them. Place in the refrigerator and let set for at least 2 hours. 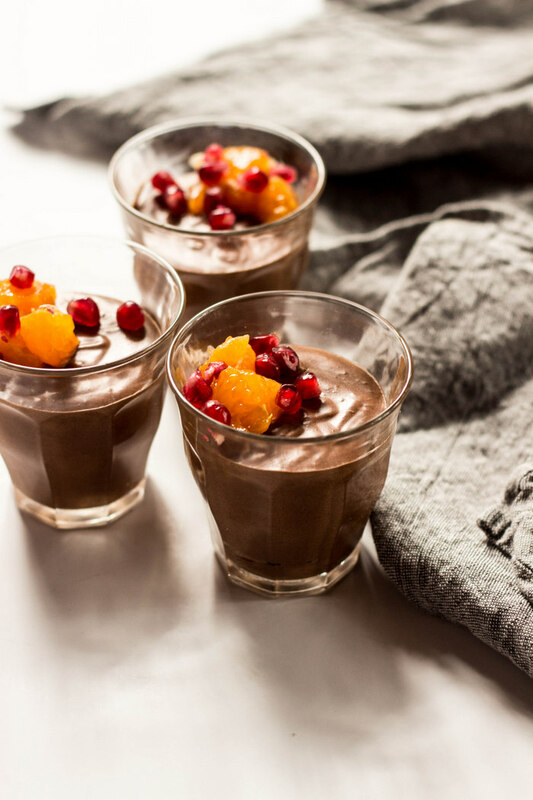 Optional, but well worth it, top with pomegranate seeds and satsuma orange chunks.